A new research paper titled “International consensus principles for ethical wildlife control” published in the journal Conservation Biology concerns ethics of human-wildlife conflicts. A new research paper titled “International consensus principles for ethical wildlife control” published in the journal Conservation Biology concerns ethics of human-wildlife conflicts. The research offers principles to guide development of international, national, and local standards for wildlife management. Island Conservation North American Regional Director Gregg Howald worked with the British Columbia Society for the Prevention of Cruelty to Animals and other animal welfare organizations to contribute to guidelines that will help reduce suffering caused by human-wildlife conflict. In the race against extinction, conservationists must move quickly while also making difficult decisions. 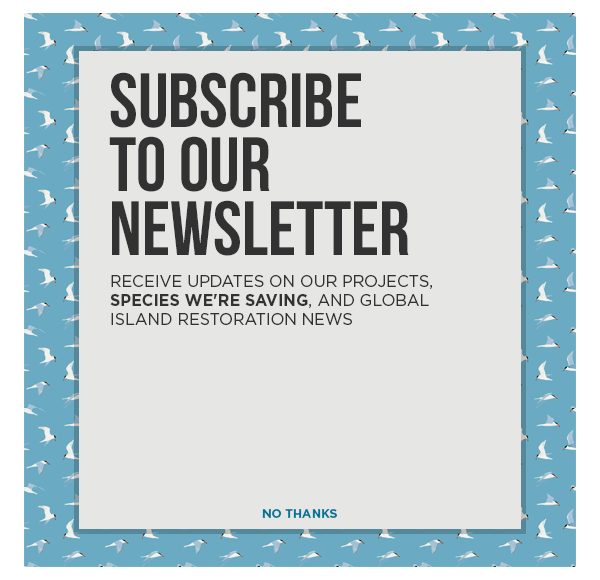 Such is the complex and challenging situation for those committed to saving island species from extinction by removing damaging invasive species. To prevent extinctions and preserve biodiversity, Island Conservation and many other organizations systematically eradicate invasive species populations from islands around the world. Every island ecosystem is unique. We carefully consider what each island needs for an operation to be successful. This new paper serves as a helpful guide for global conservation professionals involved in managing human-wildlife conflicts. Read coverage on this topic in Nature. A globally diverse group of 20 academics and humane groups has concluded that changing human practices to coexist with wildlife is the first step when considering whether, and how, to control wildlife. This is the first of seven principles for ethical wildlife control, determined by consensus at the BC SPCA and University of British Columbia (UBC) hosted Expert Forum on Wildlife Control held in Vancouver, B.C. in 2015. The findings of this international forum, attended by participants from seven countries — Australia, Brazil, Canada, New Zealand, South Africa, United Kingdom and United states — were recently published in the scientific journal Conservation Biology. Funded by the Peter Wall Institute for Advanced Studies and hosted by the BC SPCA in partnership with UBC’s Animal Welfare Program, the forum highlighted the importance of making decisions to control wildlife based on the specifics of each human-wildlife conflict case, rather than just because an animal is generically labelled a “pest animal”. The forum also benefited from contributions from global wildlife and conservation experts Drs. Liv Baker (Wesleyan University), Sandra Baker (University of Oxford), Ngaio Beausoleil & David Mellor (Massey University), Federico Costa (Universidade Federal da Bahia), David Fraser (UBC), Kate Littin (Ministry of Primary Industries New Zealand), Amanda Lombard (University of Cape Town), Daniel Ramp (University of Technology Sydney), Catherine Schuppli (UBC), and Scott Carter (Detroit Zoo) and Gregg Howald (Island Conservation). Based on discussions at the forum, the BC SPCA also developed guidance specifically for humane groups grappling with wildlife conflicts in their own communities. A workshop summary report, endorsed by Born Free Foundation, Canadian Federation of Humane Societies, Humane Society of the United States, RSPCA Australia and RSPCA UK, identifies ways humane organizations can continue to advocate for the use of ethical wildlife control practices. BC SPCA. 2016. A Common Approach to Wildlife Control for Animal Welfare and Protection Organisations.